For four glorious years, David Chokachi played blonde hottie lifeguard Cody Madison on "Baywatch" -- famously donning those red shorts and not much else from 1995-1999. The actor romanced both Pam Anderson and Carmen Electra on the series, before starring on the short-lived cult TV series "Witchblade" and a surfing series for The N called "Beyond the Break." It's clear David's love of the waves carries over into his real life, as the 47-year-old star was spotted on the beach over the weekend hitting the surf. Sporting some Hurley surf gear, the father-of-one looked confident as ever (and still pretty damn hot) on his board in Malibu. 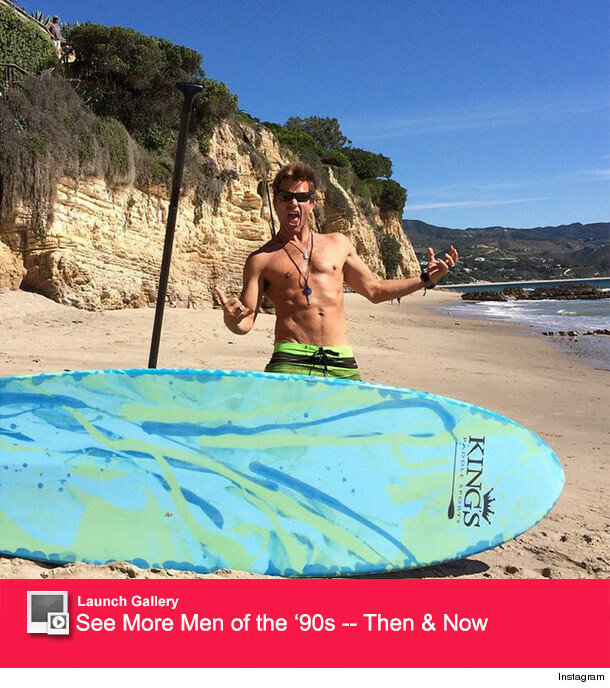 Chokachi constantly shares beach pics on his Instagram page, including this shirtless shot on the sand. Not too shabby, right? The actor -- who also starred on the VH1 reality show "Confessions of a Teen Idol" in 2009 -- and wife Susan welcomed daughter Brit back in 2011. The sighting comes after news of a remake starring The Rock and Zac Efron was finally confirmed just last week. "We've heard rumors about this movie for so many years — hopefully they do it justice. I've heard some mixed reviews. I heard they were going to do a comedy. I was hoping that they were going to do almost like what Charlie's Angels did — a cool, action-type remake of the series. But who knows," Chokachi said of a film back in 2012. Yes, it's been in development for that long. Think he'll cameo in the remake? Sound off below! "Baywatch" Star Yasmine Bleeth Resurfaces After 10 Years -- See Her Now!